The upper three inches of my GSDs ear is swollen. It feels like it is filled with fluid. It wasn't there an hour ago. No sign of trauma or bug bite. It is not feverish. It only seems to bother her if it is touched. HELP! 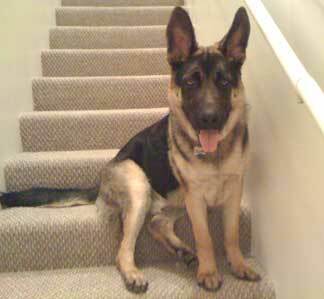 Total German Shepherd: I'm not a vet and without actually seeing it I couldn't begin to think what could be the reason for the swelling in your German Shepherds ear, however, I would suggest you get your GSD to the vet asap to have it checked. And if that isn't possible for some reason, at the least, I would certainly suggest you use the "Ask the Vet" service above which has several vets on staff all day long - every day. All you have to do is type in your question and click on the orange button and a vet will answer your question in a manner of hours normally (or maybe even less) and the cost is very reasonable. Good luck! My GSD had a similar swelling last fall (2009) and I took her to the vet immediately. Aural Hematoma. With a few drugs, she did not require surgery, the swelling was reduced, and her ear is fine now. Some GSDs (and other dogs, too) don't respond to drugs and have to undergo some type of surgery to reduce the swelling. it might be Aural Hematoma, where blood fills in the ear.